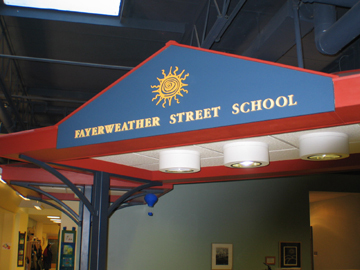 The Fayerweather Street School is a private PK-8 school located on Concord Street in Cambridge, Massachusetts. Fayerweather is settled in an eclectic neighborhood with mixed use buildings consisting of office, condominiums, health care, retail, and restaurants. The school's Board of Directors, working in collaboration with the new school Headmaster, launched Phase II of an expansion and renovation campaign targeted at clearly defining Fayerweather in the 21st Century. The Board was seeking a creative, enthusiastic, and motivated architectural firm that was eager to become immersed in the Fayerweather environment in an effort to create solutions that were both appropriate and inspirational. After interviewing several different firms, Fayerweather selected Ai3 to lead the design process; the project scope expanded to include an aggressive build-out (Phase II and III) of all previously established goals and objectives.